The ABCD Diaries: Holiday Entertaining: Palmolive Dish Soap! "Now you can freshen up your kitchen while cleaning with New Palmolive® Fresh InfusionsTM Dish Liquid. These sleek and stylish bottles will look great on any kitchen counter and are great gifts for moms, cleaning product lovers and families! They make great stocking stuffers too! This new product allows you to enhance your home and inspire freshness with the trusted Palmolive® dish liquid formula, now available in three scents – Lime Basil, Lemon Thyme, and Ginger White Tea." 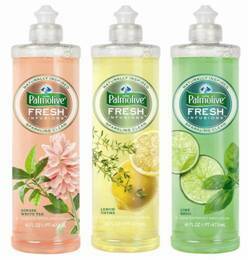 What we thought: I love the design of the new Palmolive Fresh Infusions bottle. It is so sleek and simple and looks great on my kitchen counter. The soaps come in beautiful colors and smell fantastic! It's almost like getting an aromatherapy treatment while doing dishes:) I know I'll be using Palmolive Fresh Infusions this holiday season and beyond:) ABCD Diaries gives Palmolive Fresh Infusions an A+!